sore throat « Howard J. Bennett - Pediatrician and Author in Washington, D.C.
Is scarlet fever still dangerous? Strep throat is caused by a bacterial species called Streptococcus pyogenes. There are more than 100 types of strep based on their cell structure. Of these, a small number produce a toxin that can cause scarlet fever. 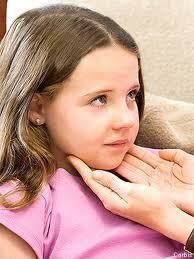 The symptoms of strep throat include fever, sore throat, headache, stomachache and fatigue. On examination, a child will typically have red and swollen tonsils with or without pus and swollen, tender lymph nodes where the neck meets the jaw. With scarlet fever strains, a child will develop additional findings: a red, strawberry-appearing tongue and a sandpapery or gooseflesh rash on the body. A week or so after the infection resolves, the skin on the child’s body may peel. Before the development of antibiotics, scarlet fever was a deadly disease. As a result, some people (especially grandparents) may worry if they hear that a child has scarlet fever. Nowadays, scarlet fever is a different illness, and doctors just consider it a strep throat with a rash. One fact about scarlet fever is very interesting. It appears that not only does a child have to be exposed to a certain strain of strep to develop scarlet fever, but his body has to react to the bacteria in such a way that the rash occurs. Although I have experienced hundreds of patients giving strep to their brothers and sisters, I have never had two cases of scarlet fever in the same family at the same time. This doesn’t mean it can’t happen, just that it’s quite rare.